Are we bio sisters? What does the DNA say? I had several people tell me they are waiting for this post. Wanting to know the results of our DNA tests. I guess that means people read the first post. It also gave me (positive) peer pressure to write Part 2. If you missed Part 1 of the Korean family drama, read this post first. 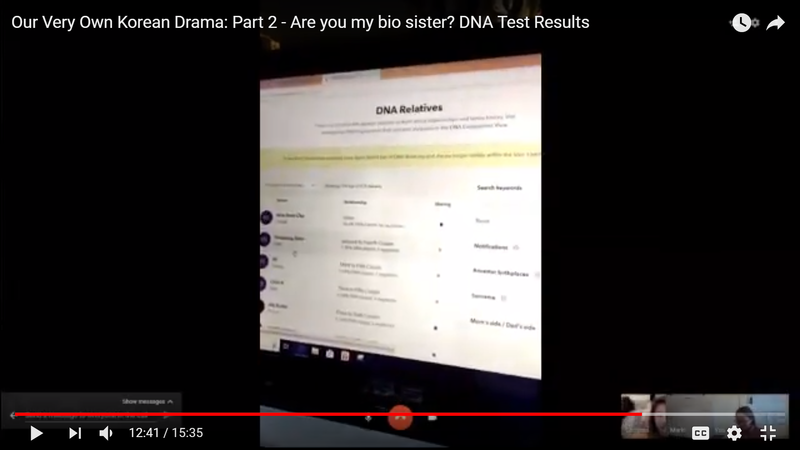 To sum it up, the first post captured musings, thoughts, and feelings as two of my sisters and I waited for the results of our DNA tests to learn if we are biologically related. After my first insufficient sample debacle, Marki, Unnie, and my niece Carrissa, were impatiently waiting for my second sample results. We promised to wait to open our results all together, and my lack of saliva held things up. We scheduled a video chat the evening I received my results. And, my nerves bubbled all day long. There was no going back once we opened these results. Was I ready? Not really. But I am famous for jumping in and working out the details later. After dealing with misplaced passwords (Marki), too many feeling questions (Heidi), and jokes about if I am part chicken (Unnie and Carrissa), we opened our reports. After a quick scan, there was silence and some disbelief. According to this first report, there are no close family relatives in the 23andMe database. Wait? Does this mean none of us are related? Not even Marki and me? I must admit to having a brief moment of feeling very alone in this world. Crushed and alone. I know intellectually that family is created, but it was hard to fight feelings of disappointment. Unnie had the best reaction. She questioned the validity of the test and insisted we should take the test again in Korea, as she would only trust Korean tests. Pause. Silence. Nervous laughter. Disbelief. Leave it up to our smart niece, Carrissa, to question if we were looking at the correct reports. After a little Google digging, she discovered that we needed to change our privacy settings and allow our results to be shared. And then, boom there it was in black and white, and purple. We are indeed biologically sisters. Whew! Relief. Joy. Love. Validation. Relief. Episode 12: We told you so. Both Marki and Unnie said their Part 2 reflections are, “We told you so.” That is it. Enough said according to them. But I, of course, have a few more words. I have been reflecting a lot on what it has meant to me to have “proof” of my biological family, and “proof” I am ethnically Korean. Two very different things, and both complicated. There is too much to unpack in this post, but I will share this. Legitimacy. As an international transracial adoptee, feelings of legitimacy are haunting. People have questioned if I am legitimately Korean, because I didn’t grow up culturally Korean. For a long time, I questioned if I could call myself legitimately Korean. What I have realized is that being Korean is a spectrum of diverse experiences, including mine – despite not fitting into the dominate narrative of what people believe is Korean. I am Korean. I struggle with gaining a greater sense of legitimacy through a DNA test. There is a lot of racist history wrapped up into this notion. Yet, I recognize that feeling. The internalized racist narratives of identity politics are deep and real. I am not immune to these societal messages, despite working hard to try to counter the narratives. Someone in my life asked me if I would still identify as Korean if my DNA results revealed I am mostly ethnically Japanese (or something other than Korean). It was an interesting question to ponder, and I found I do have a significant portion of Japanese ancestry too. In fact, my sisters joked that I am the least Korean of the three of us. The questions of legitimacy flow into my connections with my biological family as well. Curiosity was the greatest driver of this DNA exploration journey. But I would be lying if I didn’t also admit, I wanted “proof” that Marki and Unnie are irrefutably my biological sisters. Both because there are people in our bio family who don’t believe, and because there is a year and half gap in my life that has been like a missing puzzle piece. Lately, I have been overwhelmed by all the stories that I have heard about why we were given up for adoption that are now sinking in as real. Before I kept them at a slight distance. In some ways disconnected from me. More just a story than part of my story. Some of these stories fill missing holes. Some of these stories create new holes. In many ways, this journey has brought answers and in other ways this journey has created many more questions and extracted tucked away emotions. If I had one ask of you all, it is to be conscious of the language that you use around both identity and family. One of the most powerful ways I have internalized that I need “proof” to be legitimately Korean or legitimately family comes from the ways people use language. Consider what, even unintentional, messages are sent when you ask, “Are you really Korean?” Or when you ask, “Have you found your real family?” I would ask that you believe me when I say I am Korean. And, hope you understand my real family is the one who raised me. And, my biological family is the one who shares my DNA. This is not the end of our Korean drama, just opening a new season of episodes. Much appreciation and love to my sisters, Marki and Unnie for allowing me to share our story. I am grateful to have you as my sisters, both as a created family and as DNA family. If you are interested in our unedited reactions to learning our results, you can watch it here. It is a bit long, but you can see for yourself the hilarity of misplaced passwords, wondering if I am really Korean or part chicken, and other random jokes.